The one who has the seven spirits of God and the seven stars says this: 'I know your works, that you have the reputation of being alive, but you are dead. Be watchful and strengthen what is left, which is going to die, for I have not found your works completely in the sight of my God. Remember then how you accepted and heard; keep it, and repent. 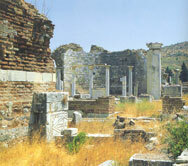 The church in Sardis (3:1-6) had become dead in spite of its reputation. Twice before the city's acropolis had fallen because Sardis had fallen asleep and let down her guard. Cyrus defeated Croesus in 546 B.C., and the Cretan general Lagoras captured it for Antiochus the Great in 218 B.C. Greek cities maintained a list of citizens in a public register.